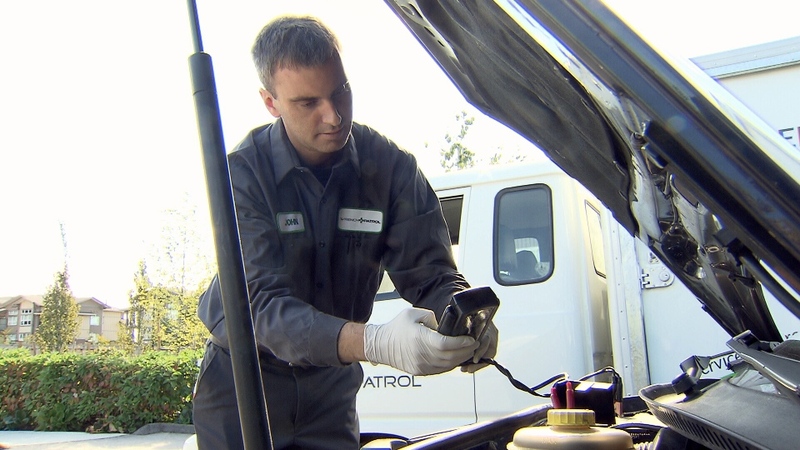 A new business in Metro Vancouver is offering time-crunched motorists a way to get their vehicles serviced without taking your car into the garage. Instead of driving to the nearest service station and leaving your vehicle for the day, the mechanic comes to you. Wrench Patrol is the brainchild of two Vancouver friends who met in university and dreamed up a mobile mechanic services as part of their MBA thesis. They saw the need for a trustworthy, convenient alternative to the standard auto mechanic shop. "While you're sitting on your couch in your pajamas or rushing to a boardroom our guys can be outside repairing your vehicle," said co-owner Iain Rogers. Rogers says almost anything that can get done at a repair centre can be done on the road. The company provides oil changes and brake jobs, as well as the replacement of belts and hoses, bulbs and wipers. "All of our technicians are red seal-certified technicians. They're not some guy off the street or a high school kid changing your oil," said Rogers. The mobile mechanics can even provide services for people who live in condos. "What we do is we actually go underneath where you would be doing your car wash, everyone has a car wash area in a condo, and we do the servicing there," said Trevor Burgess, Wrench Patrol co-owner. Wrench Patrol prides itself on being a mess free, environmentally friendly operation, recycling all of its oil and fluids. The technicians also use green products whenever possible and guarantee their work. "All of our repairs are warranty approved and so is our labour, so if you're not happy with the work that's being done, we'll come back and make it right," said Rogers. The cost of the service depends on the work you’re having done, but it does cost slightly more than your corner garage. The Wrench Patrol service hub is in Burnaby, but the mobile mechanics travel to Vancouver, North Vancouver, Port Moody, Delta, Port Coquitlam, Richmond and parts of Langley.